Pulmonary embolus is an important diagnosis to make, and of even more importance is to diagnose it with speed. Pulmonary embolus is the 3rd most common cause of death (behind stroke and MI)1, and two-thirds of the patients who will die from a PE will do so within the first hour of presentation.2 When most people think about ultrasound and PE, they think about right heart enlargement on an echo. While this is an important component to evaluate, it is less sensitive and can be less specific than we think. The absence of right heart enlargement on echo only tells us that the patient doesn’t have hemodynamic compromise from a PE at that point in time. If the right heart is enlarged, it definitely could be a large PE, but right heart enlargement is in fact more commonly seen in COPD and right heart ischemia than it is seen in PE. There are ways to differentiate between them, but I’ll be talking about how to do that in an upcoming post. If you want to learn more about right heart enlargement in the meantime, check out the podcast I did on EMRES and a post I wrote for SONOSPOT. 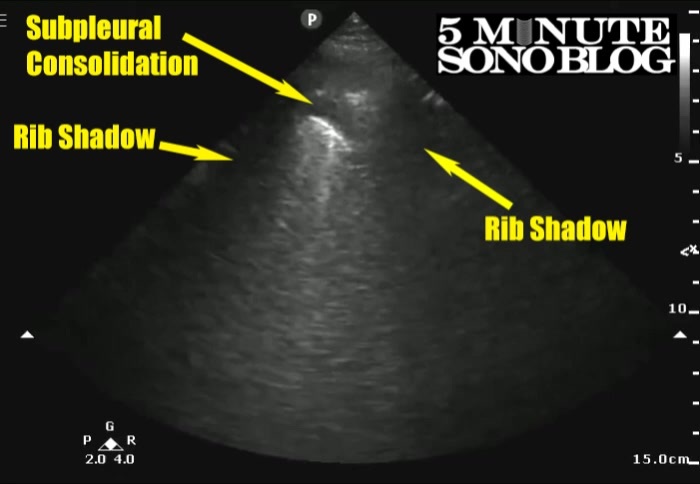 Subpleural consolidations are pleural-based hypoechoic (dark) fluid collections that can be either wedge shaped (most common), circular, or polygonal in nature and are a fairly specific sonographic finding for PE as long as there is no surrounding inflammatory changes (Inflammatory changes = b-lines = PNA). If you want to learn more about what to look for and how to do the exam, check out my 5minsono page here. You can use either the phased array probe or the curvilinear probe. Look all over the thorax, but make sure to pay special attention to the posterior lateral zones as that’s where you’re more likely to see the lesions. The thought here is that a PE will cause diminished blood flow to the distal lung parenchyma, causing ischemia that leads to infarction and necrosis. The focal ischemic changes and/or hemorrhage will manifest by increased fluid content to a focal area just distal to the PE. Decreased blood flow to the alveoli cause decreased surfactant production leading to atelectasis. 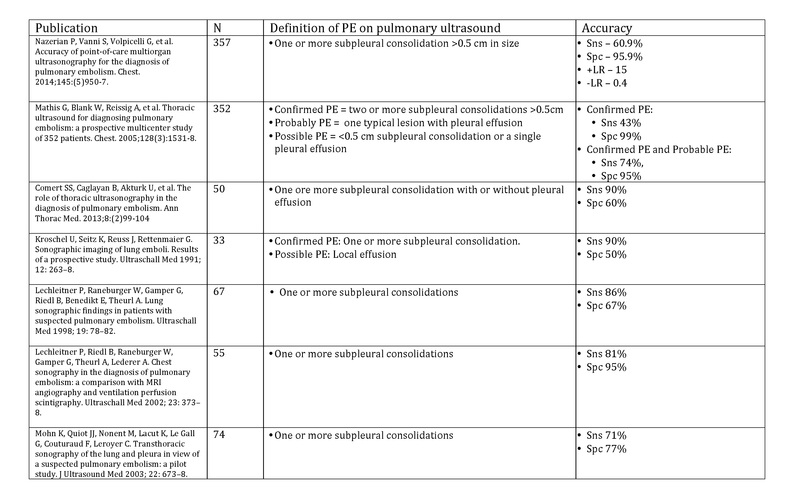 According to these radiology CT studies, subpleural, wedge-shaped consolidations are, in fact, more likely to be present in patients with PE compared to those with other pathology, but they’re definitely not as prevalent as we see in the ultrasound literature. What about the bronchial vs pulmonary circulation? The bronchial circulation does supply the vast majority of the pulmonary parenchyma, but it supplies the lung parenchyma up until you get to the terminal bronchioles, after which the lung is actually supplied by the pulmonary circulation. The theory that explains why you see sonographic subpleural consolidations is that emboli shower off smaller emboli, which then lodge distal to the terminal bronchioles. This can cause ischemia, which can lead to atelectasis and infarction. If the clot isn’t resorbed by the body or thrombolysed, it can lead to necrosis. Like anything in medicine there is no silver bullet. Ultrasound should be used as a tool in your quiver to save your dying patient, but next time you have a patient with suspected PE, throw the ultrasound probe on their chest and let me know what you see. He H, Stein MW, Zalta B, Haramati LB. Pulmonary infarction: spectrum of findings on multidetector helical CT. J Thorac Imaging. 2006;21(1):1-7. Karabulut N, Kiroğlu Y. Relationship of parenchymal and pleural abnormalities with acute pulmonary embolism: CT findings in patients with and without embolism. Diagn Interv Radiol. 2008;14(4):189-96. Squizzato A, Rancan E, Dentali F, et al. 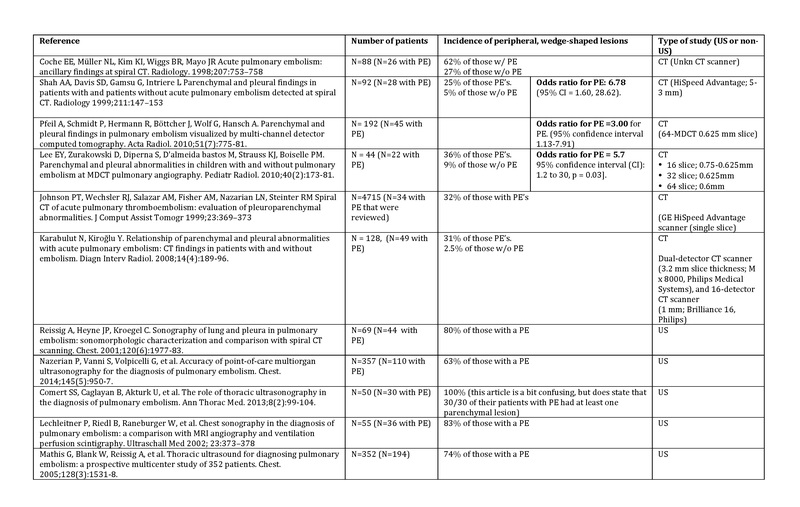 Diagnostic accuracy of lung ultrasound for pulmonary embolism: a systematic review and meta-analysis. J Thromb Haemost. 2013;11(7):1269-78. Reissig A, Heyne JP, Kroegel C. Sonography of lung and pleura in pulmonary embolism: sonomorphologic characterization and comparison with spiral CT scanning. . Chest. 2001;120(6):1977-83.